It’s soup weather! I love homemade soups in the pressure cooker. 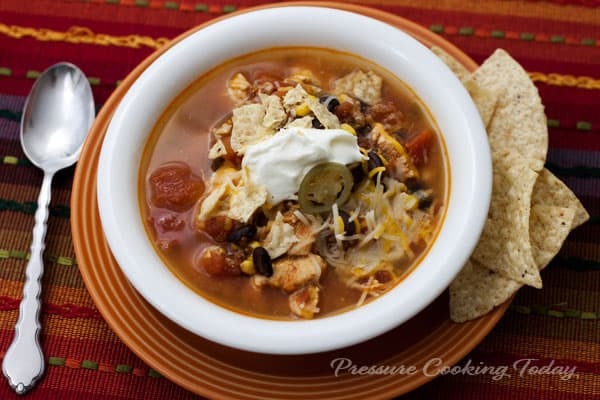 So today, I’m sharing the best pressure cooker soup recipes on Pressure Cooking Today. My soup recipes are the recipes I make most often in the pressure cooker. You get slow cooked flavor in a fraction of the time. Spicy Chicken Soup is my family’s favorite soup. It was one of the first recipes I posted on Barbara Bakes. It’s a slow cooker recipe that cooks on low for 6 – 8 hours. I transformed it into a pressure cooker recipe and now it cooks in only 8 minutes. You can even use frozen chicken breasts and it cooks in only 11 minutes! Butternut Squash Soup with Chicken and Orzo is the soup I make the most. My husband loves to have it in the freezer in individual portions so he can grab it for a quick lunch. At first he was unsure about butternut squash in a soup, but the squash flavor is very mild. The black pepper and red pepper flakes give it a little bit of heat and the squash just gives it great body and beautiful color. 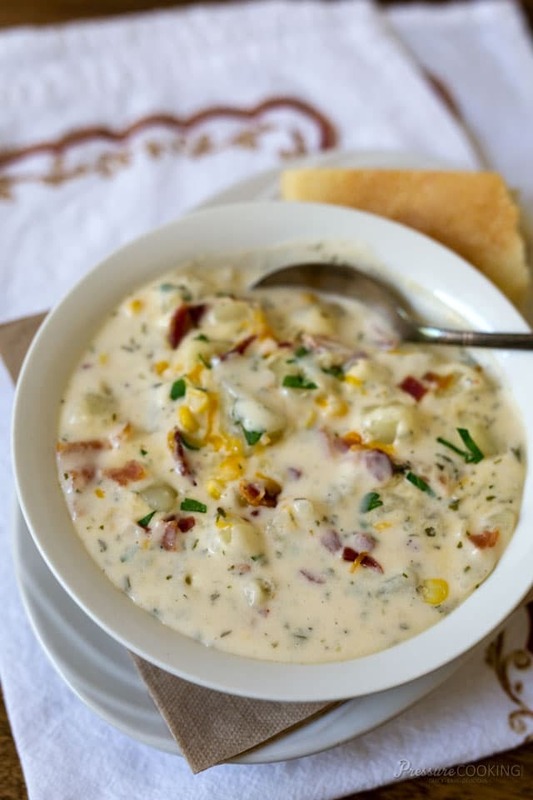 Chunky Potato Cheese Soup loaded with chunky potatoes, bacon, corn and two kinds of cheese is another soup that I make often. It’s creamy and delicious. Pressure Cooker Vegetable Beef and Rice Soup – a hearty meal that comes together quickly and is on the table in a flash. Homemade Chicken Noodle Soup is so much better than anything you can get in a can. 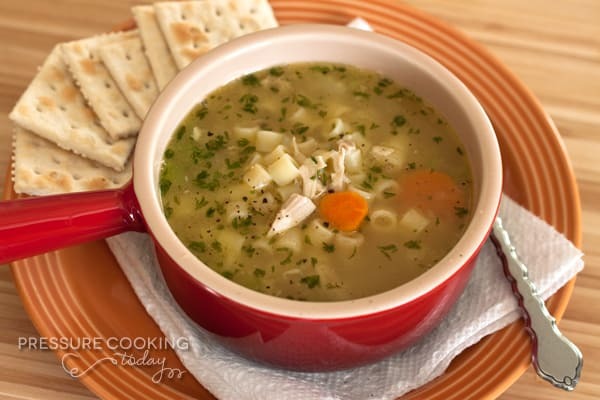 It’s the easy to make Homemade Chicken Stock that really sets this chicken noodle soup apart. 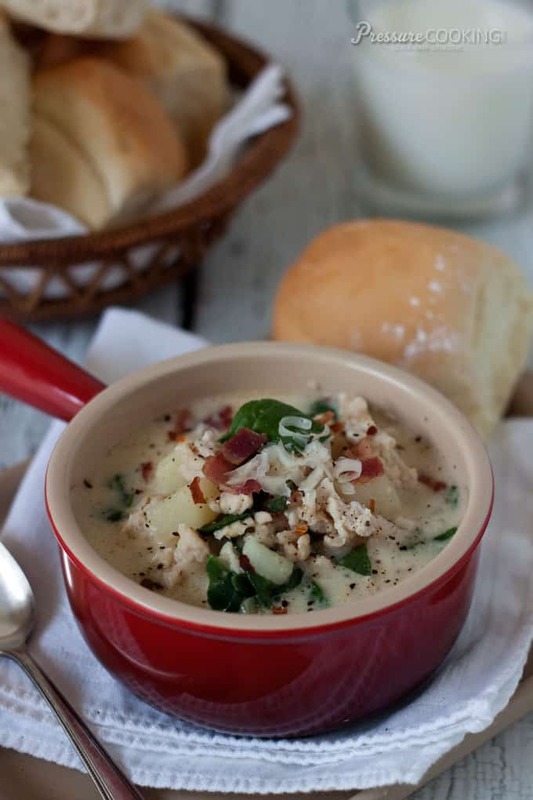 Creamy Chicken and Wild Rice Soup – is a new favorite. It’s a quick recipe and super easy to make. 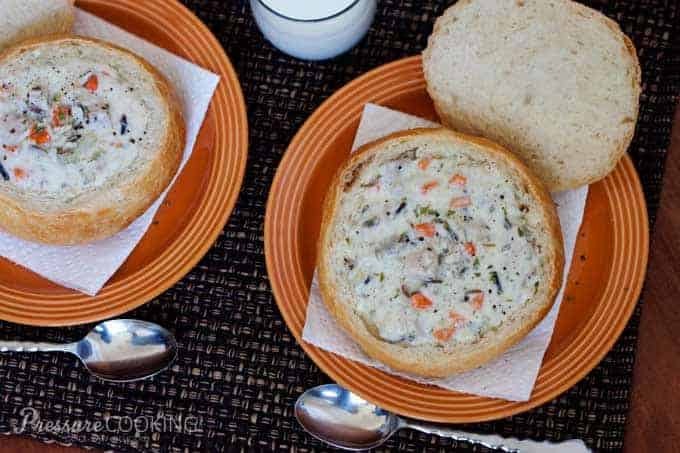 You’ll love that it’s loaded with chicken, long grain and wild rice, carrots, onion and celery. Homemade Creamy Tomato Basil Parmesan Soup made with fresh from the garden tomatoes and basil. In the winter you can substitute canned tomatoes. 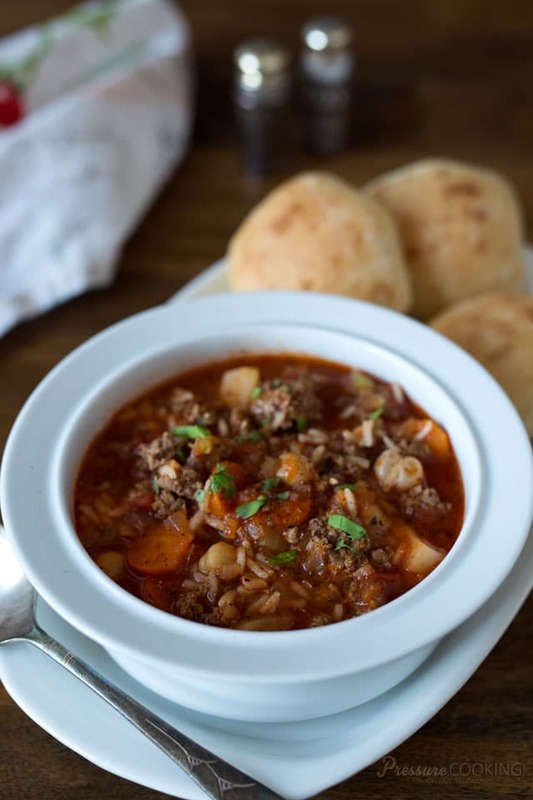 Pork and Hominy Stew – Pork shoulder cooked in a spicy broth until it’s fork tender, then it’s shredded and combine with hominy to make a hearty stew. If you haven’t tried hominy yet, give it a try. It’s delicious and a good source of fiber. Hominy is just dried kernels of corn that have been soaked in lime or lye until the kernels are soft and swollen, and slightly chewy. Pressure Cooker Zuppa Toscana – A lightened-up pressure cooker zuppa toscana – Olive Garden’s popular soup made with sausage, potatoes, and spinach. 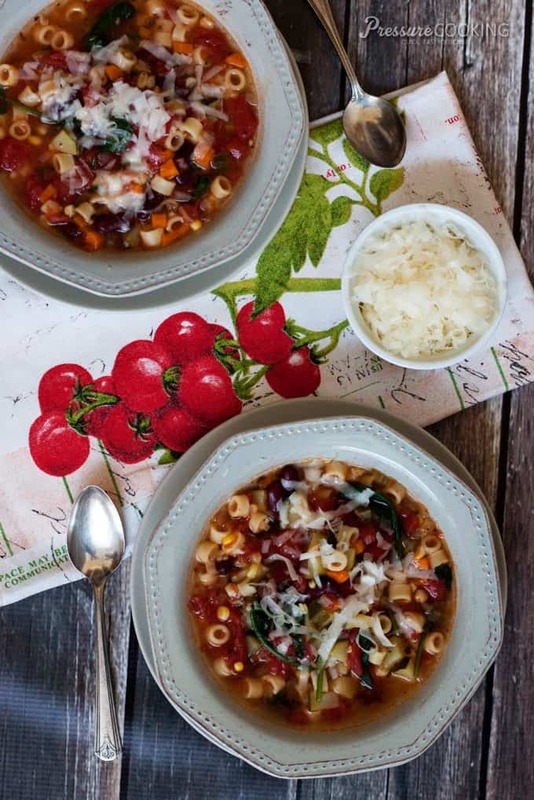 Garden Minestrone Soup – Fresh, healthy, and packed with flavor and veggies. Change it up with your favorite. I hope you’ll give these soup recipes a try. 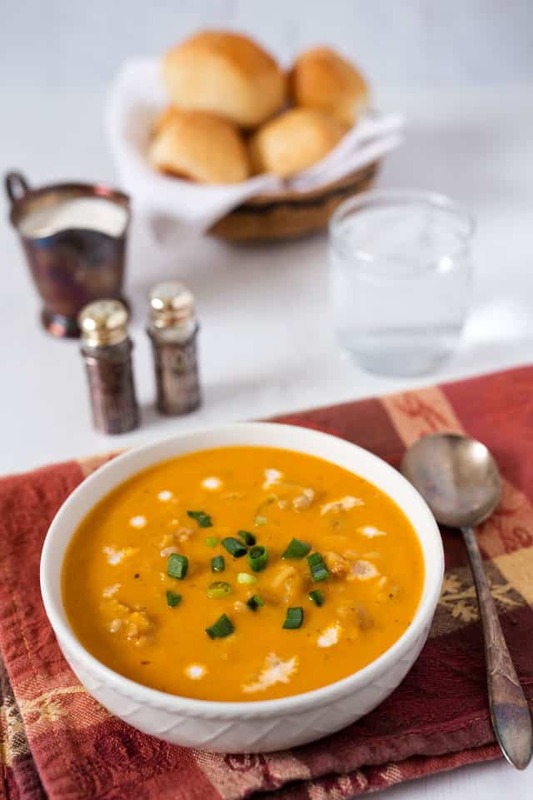 Soup is generally lower in calories, and you can bulk them up with extra veggies. We almost always have homemade soup frozen in individual portions in the fridge for quick lunches or dinners. For more great soup recipes visit the Soup Section of My Recipe Index. I have to say that your Zuppa Toscana is absolutely the best soup I’ve ever eaten. My family agrees! Last time I made it with sliced spicy Andouille sausage (and included the red pepper, we like spicy) and I had both kale and spinach on hand so in went those too. I had tons, so I froze it in individual containers for work lunches. It freezes really well and when I heat it up everyone asks for the recipe 🙂 Thank you so much! Sounds like delicious changes. Thanks for sharing Deborah. Glad it was a hit! I just got an IP this last month but am a bit overwhelmed and afraid. I’m trying your Beef & Broccoli recipe tomorrow. My question is how do you cook bean soup in the IP — I’ve read that you must have 1 cup of liquid in the bottom to prevent burning. I bought one of those multi bean (must soak first) soups to make w/ sausage and I’m wondering if it’s safe to use in a pressure cooker (I know they expand). And how do I fix the recipe on the back to use in the pressure cooker? Hi Kathleen – yes, it’s safe to use a multi bean mix in the pressure cooker. Here’s some tips on cooking beans http://www.pressurecookingtoday.com/pressure-cooked-beans-most-beans-cook-in-less-than-10-minutes/ Enjoy the Beef and Broccoli! After you’ve cooked a few things, you’ll see there’s nothing to be afraid of. HI. I want to try your recipes, but I own an older style Presto cooker, it isn’t electric. Do all your recipes translate to that so that I can start trying them? Also, I want to substitute soy or almond milk for where you have creamy soups, do you see any problems with that? Thanks! Your recipes are wonderful. I have never used an appliance as much as I use my pressure cooker. Our family’s favorite is the Creamy Chicken and Wild Rice. I must make that twice a month or more. Thanks for all of the delicious recipes and showing me how to use my pressure cooker! Thanks so much Melissa! Glad you’re loving pressure cooking as much as I do. Lovely recipes, looking forward to trying several in my new IP. Thank you for the slow cooker conversion information. However, Its kale and Italian sausage (turkey) that belongs in the Zuppa Toscana Soup to really have that Olive garden flavor. I guess its sort of a pet peeve seeing so many recipes out there using spinach which is not authentic. I usually use half n half but will be trying evaporated milk when I try your pressure cooker directions. It is one of my favorite soups. On a side note spinach can impart a fishy taste when frozen, the kale freezes just fine. I also add extra fennel seeds and if using spicy Italian sausage omit the red pepper flakes. Definitely make it however is best for you. I have a hard time getting my family to eat kale, so spinach is what I have on hand generally. Nice tip about freezing kale. Thanks! I like the idea of freezing individual portions of soup. Do you use bags or cups or what? Thanks Beth – I usually freeze the soup in quart size freezer Ziploc bags. I’ll put the frozen bag in a bowl in the microwave then when the soup is thawed enough to dump into the bowl, I finish heating it in the bowl. But I have seen others who freeze their soup in round shapes and then reheat/thaw the soup by pressure cooking it for 1 minute in a bowl in the pressure cooker. I’ve been meaning to try that because it’s more hands off and probably a gentler way to reheat than the microwave. Are there any of the above top 10 soups (or others) that lend themselves to freezing well? I’m stocking my parents freezer with a variety of soups as one of my Christmas gifts, so I working on my list. Thanks! Hi Sue – such a nice idea. The Spicy Chicken Soup freezes very well and you can adjust the spice level if you need to. When I freeze the chicken noodle soup, I freeze the noodles separately so they don’t absorb all the broth or get to soft. You could also do that with the Minestrone. I like to freeze individual servings. 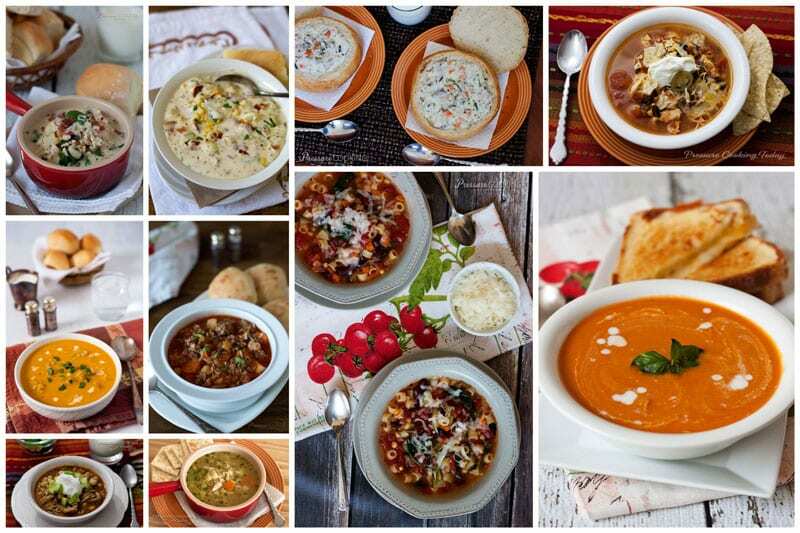 Thank you for sharing your top favorite soups! I just bought a IP from Amazon Prime and should arrive today at my house! So i have been searching websites for best best recipes to try out. 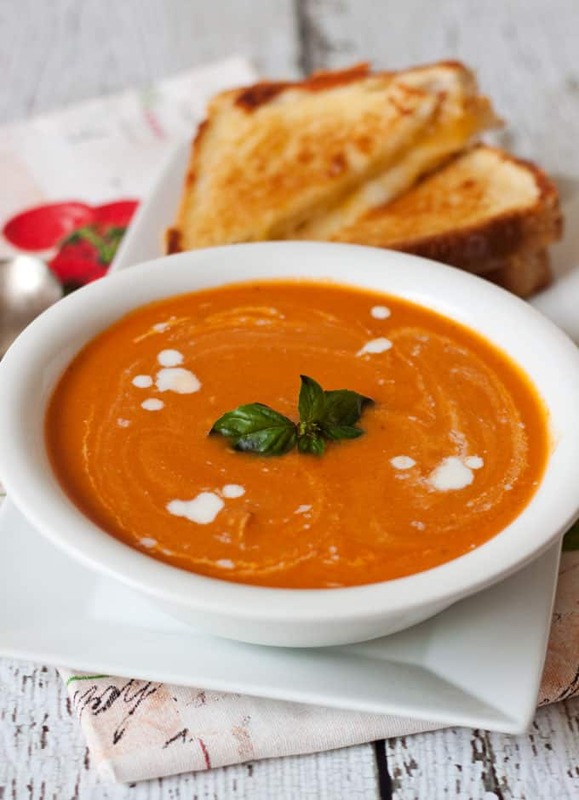 We love soups especially in our winter months as it can be very cold. Thank you again because we all appreciate making favorites. Welcome Anita! 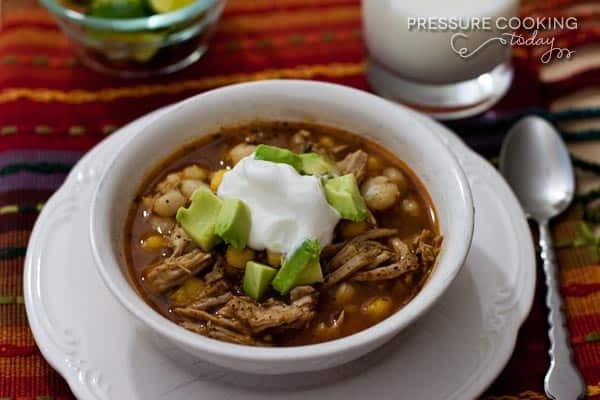 Soups are one of my favorite things to cook in the Instant Pot. They’re a great choice to get started with. Have fun! I cannot thank you enough for the zuppa toscana recipe. It’s a hit here at our house! We grew a late fall crop of spinach and it’s been great to run outside and harvest some spinach. A quick chop, toss it in the pot and my husband is an incredibly happy guy. Hi Barbara! I am a real newby to pressure cooking. I just got my Instant Pot a month ago for Christmas, so I really appreciate all the lovely recipes and help you give for working with a pressure cooker. So far, I have only tried 3 dishes. A pork loin roast that was hard frozen from the freezer, done with potatoes and carrots that was absolutely fork tender and delicious, and another pork dish, pork chops and mushroom gravy which hit the roof of approval with my hubby! Then I also made your creamy chicken and wild rice soup! Oh my goodness, that was so delicious! I am looking forward to trying many more of your wonderful recipes. Thanks so much for sharing. Let’s see…I’ve made your turkey stock and soup which are out of this world and using the pressure cooker is the ONLY way I’ll make turkey or chicken stock now…I LOVE the Garden Minestrone Soup and I just made your Pressure Cooker Zuppa Toscana today because it was such a hit the first time I made it that Bob requested it again. 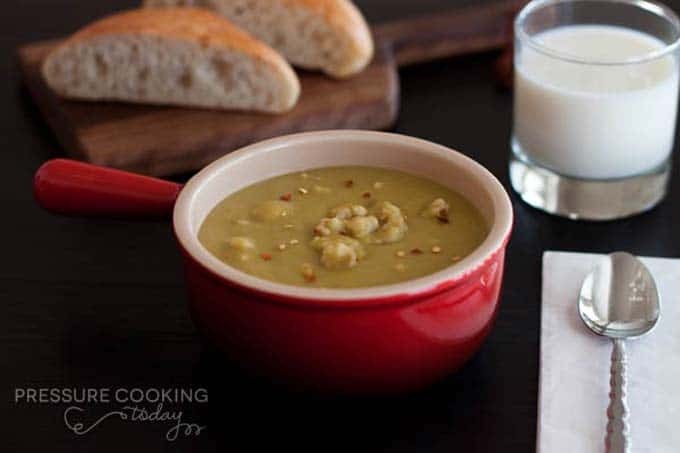 I love using the pressure cooker to make soup-and I can’t wait to try a few more of your recipes, Barbara. Thanks Carol! I agree it’s the only way to make stock. Glad you enjoyed the recipe.